The Chattahoochee, Okefenokee, & Ogeechee Occasional Gazette - ZineWiki - the history and culture of zines, independent media and the small press. The Chattahoochee, Okefenokee, & Ogeechee Occasional Gazette is a science fiction fanzine by Lee Hoffman. Aside from her best known publication, Quandry, Lee Hoffman released many one shot titles and short run fanzines during the 1950s and The Chattahoochee, Okefenokee, & Ogeechee Occasional Gazette was one of these. It was published in Savannah Georgia, U.S.A. The full title of the first issue was The Chattahoochee, Okefenokee, & Ogeechee Occasional Gazette combined with the Wassaw and Ossabaw Backwater Journal and Tangent, plus rotogravure-type section, A La Tabunko, with added feature, portions of Luna Pono. Robin Bailey, writing for his Livejournal, describes the contents: "The first part of it details her ascent (or perhaps descent) into acti-fandom from her earliest encounter with an old, half-rusted typewriter in her attic...And I guess that I'm not the only one waxing nostalgic about fanzines. At one point, she writes, "Do you remember the fanzines of the mid-forties like unto VAMPIRE? We (I and some others) have been reminiscing about these mags." Also included are reviews of the books Time Bomb by Wilson Tucker (aka Bob Tucker, editor of Le Zombie and Science Fiction Newsletter), and The Natural History of Nonsense by E.E. Evans (co-editor of Nova). The May 1952 issue was mailed out through the Fantasy Amateur Press Association (FAPA) with Bob Tucker's Fantasy Jackass #2. According to the British Fanzine Bibliography, the Winter 1955 issue was a split zine with Ken and Pam Bulmer's Steam, and was co-edited by Lee with Jesse Floyd and Charles Wells. The 1957 issue was titled The Chattahoochee, Okefenokee, and Ogeechee Occassional Gazette Combined With the Wassaw and Ossabaw Backwater Journal and the Castleton Corners, New Dorp and Arthur Kill Bugle Illustrated. Three un-numbered issues were released. Later in the 1950s, Lee Hoffman published Chooog for FAPA, a title that features all the first letters of The Chattahoochee, Okefenokee, & Ogeechee Occasional Gazette, Ch-o-o-o-g. 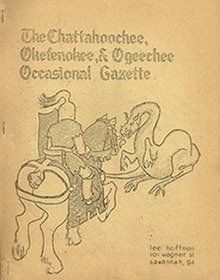 The Chattahoochee, Okefenokee, & Ogeechee Occasional Gazette is held at Hargrett Rare Books, University of Georgia. This page was last modified on 11 August 2012, at 14:38.